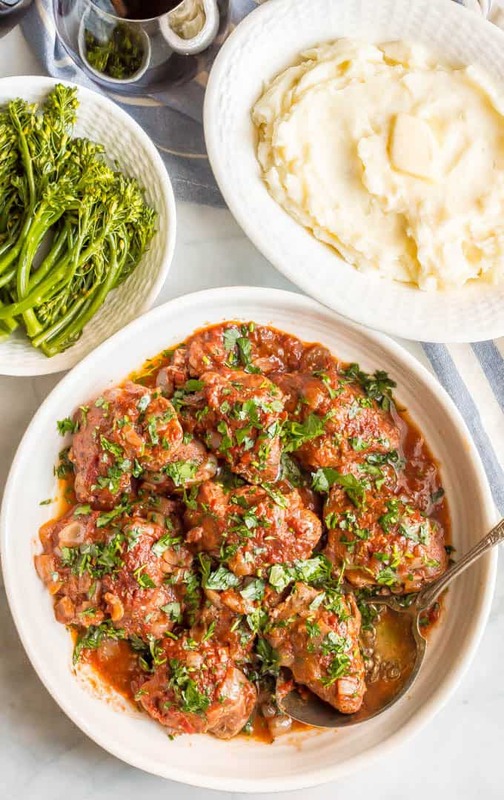 Slow cooker bistro chicken thighs are easy to prep and cook all day in a delicious, rich red wine and tomato sauce. Serve over mashed potatoes, rice or pasta for a yummy dinner! I seriously cannot fathom that we are just 4 days from Christmas. I mean, yes, I’ve had my son’s preschool Christmas show (nothing cuter than a bunch of under 5-year-olds singing and dancing on stage for an hour!) and I took my daughter to the Nutcracker. And we’ve had multiple Santa visits (another one coming tonight) and made ALL the cookies and done all the decorating. But still. It’s almost Christmas… what the what?!?! And yet, I’m so ready and so excited and so into it. I have a few more Christmas movies I need to watch, a few last presents to wrap, maybe one more batch of cookies to make, but overall I’m pretty much set and feeling good about it all. We are finishing the 2017 Recipe Redux challenges with one that has us find a recipe in a cookbook on page 201, 217, 127, etc – basically some configuration of the numbers of the current year. And I immediately starting thumbing through my slow cooker cookbooks to find something. 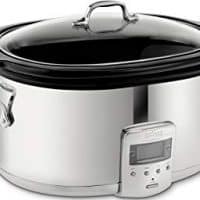 I love slow cooker recipes, especially on busy days or days where I know I’m gonna be pressed for time at dinner. 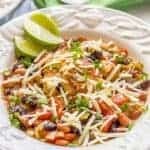 And so many of you love crock pot recipes and request them too! 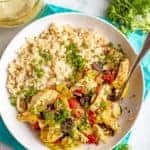 My slow cooker balsamic chicken and slow cooker apricot chicken are always favorites and my slow cooker tequila chicken and slow cooker teriyaki chicken are great for being so versatile and serving in wraps, rice bowls, for meal prep and more. 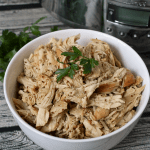 And today’s slow cooker bistro chicken will surely be a new favorite! 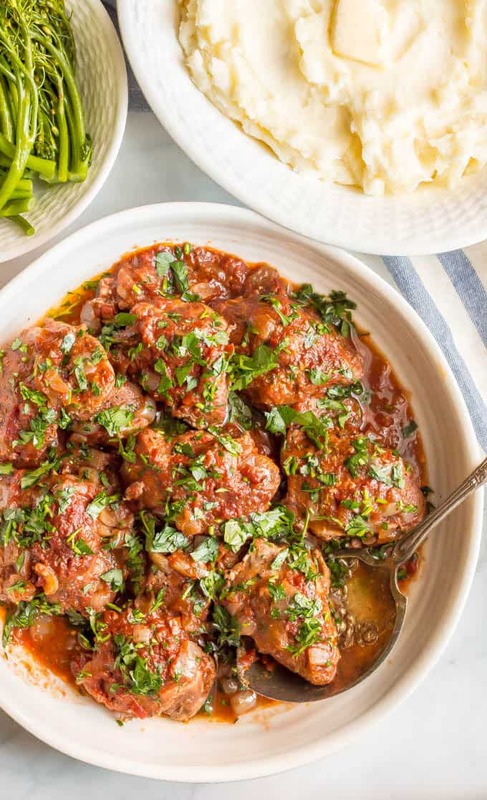 This French-inspired dish is full of rich flavors from the luscious wine and tomato sauce, the aromatics of the onion and garlic and thyme, and the tender, dark meat chicken thighs. I also love that it’s just ready to serve – no shredding or sauce making or anything to do when you get home. Just dish it up! Oh, and I should mention, this is adapted from Slow Cooker: The Best Cookbook Ever (page 107 so I stayed in line with the Redux theme!). You could also substitute boneless, skinless chicken breasts here if you prefer. I used a Cabernet Sauvignon for the wine, but any dry red wine will do. 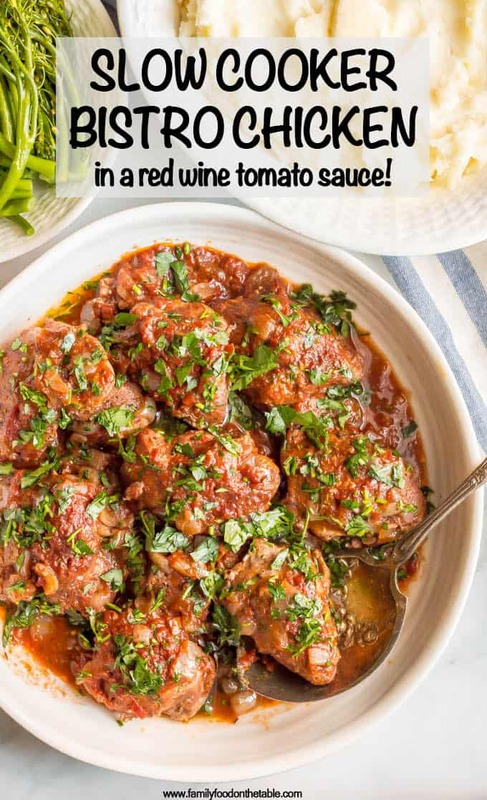 Use some in the recipe and save the rest for dinner! Next time, I think I’ll add some mushrooms to this. If you want to as well, I’d suggest a 16 oz. package of white button mushrooms, sliced, added to the pan along with the onions to soften slightly. Yum! We served our slow cooker bistro chicken with mashed potatoes and I highly recommend that! The creamy potatoes are perfect for soaking up some of that extra sauce! But I think pasta or rice would be great, too. Or just a great loaf of bread that you can tear into pieces to sop up the juices on your plate. Deliciousness! Add your favorite steamed veggie — we had broccolini here — or my quick and easy green beans with mustard butter sauce and dinner is served! I’ll be skipping Monday since it’s Christmas but I’ll be back next Thursday with a light and fresh salad to get us ready for a fresh start in the new year. 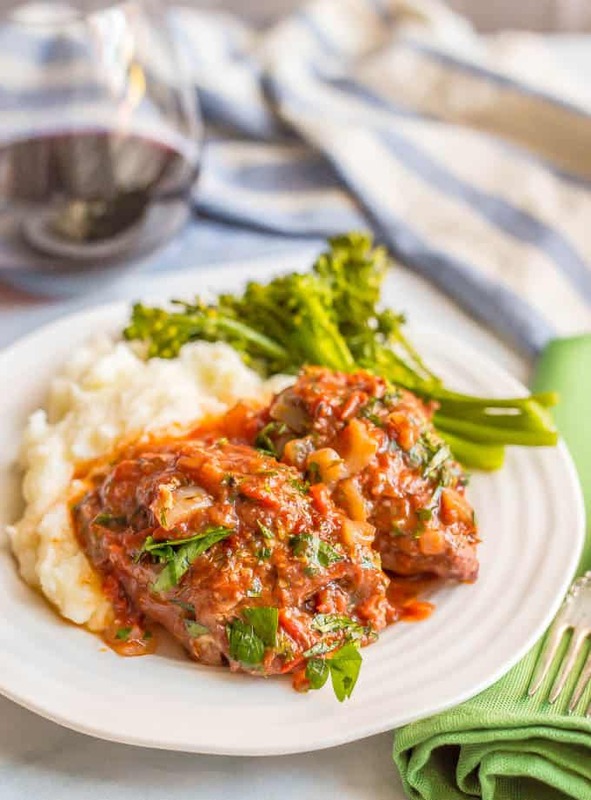 Slow cooker bistro chicken thighs are easy to prep and cook all day in a delicious, rich red wine and tomato sauce. Season chicken thighs with salt and pepper. Sear the chicken in the skillet until well browned on both sides, about 10 minutes total. Transfer the chicken thighs to the insert of the slow cooker. 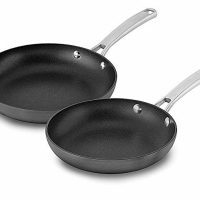 Lower the heat to medium and melt the butter in the same skillet. Add the onions, garlic and thyme and sauté until the onion is softened, about 5 minutes. Add the wine and tomatoes to the pan and scrape up any browned bits on the bottom of the pan. Transfer the mixture to the slow cooker and pour over the chicken thighs. Cover and cook on low for 6-7 hours, until the chicken is cooked through. Sprinkle with parsley and serve over mashed potatoes, pasta or rice. I used boneless, skinless chicken thighs for this but the original calls for bone-in, which you could use as well. (You do need to remove the skin though.) You could also substitute boneless, skinless chicken breasts here if you prefer. If you’d like to add mushrooms, I’d suggest a 16 oz. package of white button mushrooms, sliced, added to the pan along with the onions to soften slightly. Adapted from Slow Cooker: The Best Cookbook Ever. Great job being so prepared! I am envious…I feel like a chicken running around with my head cut off because I left so much for last minute. Going to try and power thru it all today so starting tomorrow we can just celebrate with xmas movies and hot cocoa. 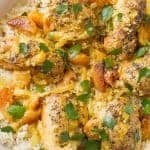 This recipe is beautiful, I am such a huge fan of chicken thighs that I am definitely bookmarking this for later! I hope you can get through that to-do list and then relax a little over the holiday weekend! (And I hope you try this too!) Happy holidays! 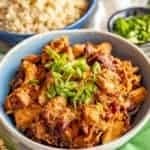 Slow cooker recipes are so perfect for this busy time of year! 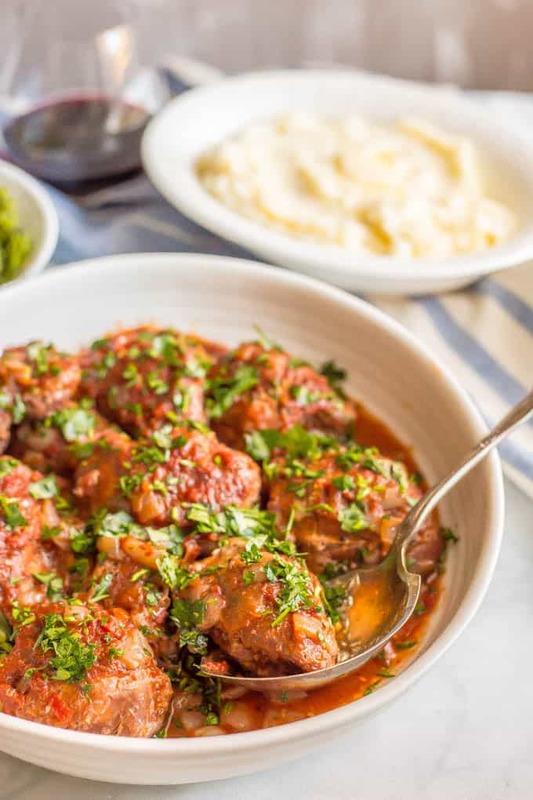 These chicken thighs look delicious, I love the idea of serving them with mashed potatoes, a beautifully cozy and tasty dish! Drooling already. These look so bold and full of amazing flavors- the most perfect family dinner! Oooh pinning this now and I think I’ll do what you want to next time – add some mushrooms in! This chicken looks delicious! 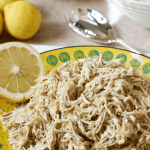 Pinning to try soon… slow cooker dinners are a life saver! They really are! I hope you enjoy it Meredith! This is making me hungry! I ‘m adding this to my slow cooker recipe collection. Yay, I hope you enjoy it Anne! Definitely trying this recipe! 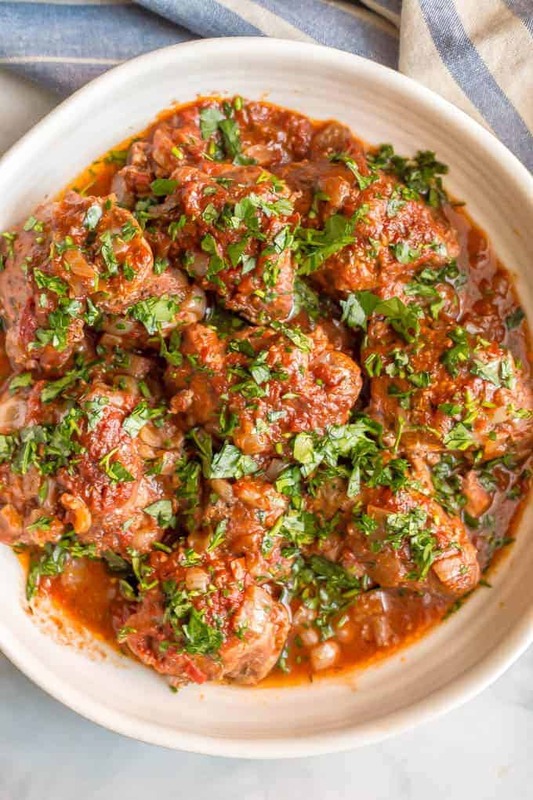 We love chicken thigh recipes and I need to use my slow cooker more often! I hope you enjoy it Maria! 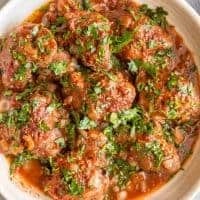 I’m all about slow cooker recipes, and I happen to have some chicken thighs I’ve been meaning to use up! 😀 Can’t wait to try this out! It was meant to be! I hope you love it Farrah!